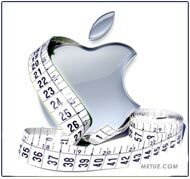 iTunes has long been looked at as the loss leader, the bridge that links Apple’s assorted media products. It drives product sales and helps power iPods, iPhones, Apple TV and Mac multimedia. But that role of servitude hasn’t stopped it from turning into a significant force. 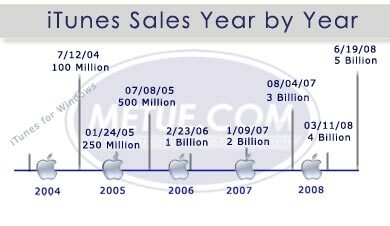 Apple announced today, the iTunes store crossed the 5 billion song barrier. That’s 5 billion songs sold, up a billion from the 4billion announced in January. At 99cents a song, that means the store has generated nearly $5billion in music revenue. That’s $3.5billion to artists and labels and $1.5billion to Apple (based on widely estimated revenue sharing splits). That’s not too shabby for an auxiliary program that helps promote hardware sales. Even more impressive, however, might be the story surrounding video sales. Despite a market in infant stages, despite a general lack of bridge connecting PC to TV (Apple TV notwithstanding), Apple said customers are still either renting or buying 50k movies a day from iTunes. That translates to more than 18million movies distributed a year. A 50/50 split of sales versus rentals, for example, yields $143.9m. If it skews 75/25 in favor of sales, the revenue ratchets up to $187.9million. Mix in TV sales, which aren’t included and have been doing better volume than movies, and you could add another $150 to $200m. That totals much as $387m on the high side. To put that in perspective and lend a little color, Netflix, a well established rental business catering to well entrenched and widely accepted technology (DVDs/DVD players) had quarterly movie video rental revenue of $326.2m in April. Apple’s potentially in reach of generating one fourth that revenue (per the same time period) in an infant market. That’s worth keeping an eye on.